Tough workplace conversations are difficult to handle, and this is why most of us try to avoid it. When you avoid tough conversation, you lean into vulnerability instead of doing good office work. If you have to deal with tough conversation regularly, then this book is for you. If you are looking for a complete tough conversation handbook, then this book offers a step-by-step approach to having those conversations with less stress and more success. This book offers a respectful and realistic approach on how to anticipate and engage in these encounters in a way that will achieve the best results for everyone involved. Whether you are an employee, coworker or the boss, you need to have tough conversations from time to time. This tough conversation guide can help you bite the bullet and say what needs saying. Unlike most books on the subject, this tough conversation guide is brief, to the point and easy to understand. This tough conversation book offers realistic and simple dialogues that employees and managers can use to facilitate direct, clear interactions with each other. One of the biggest obstacles of tough conversation is fear. Eliminating fear can make you better at tough conversation and this book shows you how to replace fear with courage and confidence. This book makes you confident and provides tools and tactics to navigate the tough conversation confidently and effectively. This solution-oriented, practical book describes some of the most common work-related communication problems most employees are likely to encounter. This tough conversation book is for both employees and managers who can use the guidance provided in the book to protect themselves and their organizations. Once you master the skills mentioned in this book, you will find all your conversations becoming easier, less stressful and more fruitful and productive. As the author of this book, I believe that this book will be an indispensable reference and trusted guide for you who may want to deal with difficult conversations that you have been confronting with at work. Once you read this book, I guarantee you that you will have learned an extraordinarily wide range of useful, and practical techniques that will help you become successful particularly in office when doing business. 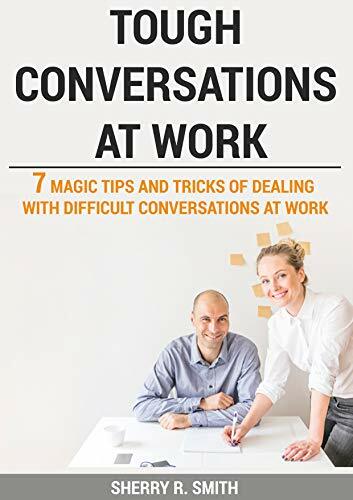 Don’t delay any more seconds, scroll back up, DOWNLOAD your copy NOW for only $3.99 and start the journey of mastering “7 Magic tips and tricks of dealing with difficult conversations at work” TODAY!